This is a great article on the Toronto Star website by George Carras, the president of RealNet Canada Inc., where George helps explain the current state of the new condo market in the Greater Toronto Area. “We’ve reached the halfway point of 2012 and what better time for a look at the new home market. After all, a bit of perspective helps to provide better understanding, and the more perspectives you have, the better your understanding. 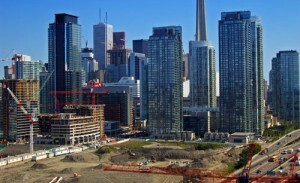 • During the first six months of 2012, there have been 11,492 new condos sold in the GTA. That’s down 21 per cent from last year. • The remaining highrise inventory at the end of June stood at 20,133 units, a record high. • The RealNet Index Price of a new highrise condo dropped to $432,256, down 0.5 per cent from the beginning of the year. For those seeking to support a certain position or point of view about the real estate market, these might be all the facts you need. But if you want illumination, please read on. If you know that last year was a record year for new condo sales, your perspective on this year’s 21 per cent drop in sales might change. It may also help to know that 2012 year-to-date highrise sales are at the second-highest level on record — 38 per cent above the long-term average for the period (which is 8,339 sales). For further perspective, step back and remember that new condo development does not exist in a vacuum. Condos make up the highrise component of the new home market. Lowrise homes (detached, semi-detached, townhomes and links) comprise the other part. If you want to have proper perspective on the highrise market, it is essential that you understand what has been happening in the lowrise market. During the first half of 2012 there have been 9,293 new lowrise homes sold in the GTA — that’s 4 per cent fewer than last year and it represents the fourth weakest year on record. One of the reasons for that is the record-low levels of available lowrise inventory, a result of the province’s intensification policies. At the end of June, there were a near-record low 5,797 new lowrise homes remaining in GTA builder inventories. The index price for lowrise ended the period at $603,102, a near-record-high level. This resulted in the biggest price difference on record between a new lowrise home and a new highrise new home: $170,846. How have total new home sales — lowrise plus highrise — been so far in 2012? During the first six months of the year, a total of 20,875 new homes were sold. That’s down 14 per cent from last year (which was the second best year on record for total sales). But when compared to the long-term average of 21,141 for that same period, 2012 so far has been average. With the record high highrise inventory of 20,133 units, and a near-record-low lowrise inventory of 5,797 units, there are currently 25,930 new home options available to GTA buyers. How does that compare with previous years? Over the long term, total inventories have ranged between 25,000 and 30,000 units, so the growth in highrise inventories is just helping to bring the total inventories back to the low end of normal, albeit a new normal that has seen highrise condos come to dominate the market as a result of the intensification growth plan. If you’re trying to understand the GTA new condo market, monitor it monthly with official information — including from RealNet, the official source of new home information for both the Building Industry and Land Development Association and the Toronto Real Estate Board — and put things in perspective by taking into account the entire GTA new home and property market, not just one part of it.